This morning Jeremy took Stephanie to Rocky Park - it was her first time there, and they enjoyed the double slippery-dip and the swings. Then it was home to bake and eat some cherry muffins, and afterwards to make (but not eat!) a cherry pie out of pink and brown playdoh. Jeremy has now finished Week 5 of kindy (Week 1 consisted of only one day! ), and his teacher says that his writing has improved so much in those few weeks. He told her that he has been doing "secret work" at home, as he has been writing letters to BaBa! He sees Stephanie writing and he wants to write too. Our hearts well up with thanksgiving and wonder whenever we see Jeremy enjoying life - and that is very often! Whether he is at home singing us a new song that he learnt at school, or at school running around the playground and laughing, whenever he raises his eyebrows in delight or yells with excitement when he finds a matching pair in a game of memory, we marvel at the precious gift of God's healing of our little man. Jeremy received this award at the K-2 Assembly today. Stephanie said that he was standing the "stillest", holding his award in front of the rest of the infants school while the other children received their awards. It was the first time this year that these awards were handed out (they are given out on a weekly basis), and there was only one per class. He must have been very pleased with himself! Praise God that he is enjoying school so much! Jeremy wanted to run laps around the playground for 15 minutes while he waited for Stephanie to finish school! At least the cool change had come in by lunchtime today, and it wasn't unbearably hot while he was racing about. Usually he says "Mummy, chase me! ", and dashes off in the heat expecting me to follow! Back to school - and on such a hot day too. He and Stephanie were treated to a big icy-cold slurpee after school to cool them down, even though Jeremy's energy levels didn't need topping up! Jeremy has been waking quite early this week - it is great how he has so much energy, but it is very tiring at 5.30am. It is hard to be enthusiastic about getting up when your body wants a sleep in... However, we were motivated to get a hurry on as the bouncy, energetic child was also hungry, and quite vocal about his need to consume breakfast. As we were getting ready for church, we marvelled again at how soft and fluffy Jeremy's hair is - we managed to spike up the curly hair just by adding water. It was only one year ago today that Jeremy was first diagnosed with Leukaemia - yet it has felt like a much longer time. We still remember standing around in a small room, within the emergency department, stunned, and not knowing anything about what lay ahead. Previous memories of Leukaemia were of the few ads on Channel Ten as children. The journey we walked has not been a pleasant one (no life threatening illness ever is), and we are grateful for the many blessings and support we have received along the way. We are very thankful that Jeremy is now in remission, and that he is now so full of life. Tomorrow will be one year since Jeremy was diagnosed with leukaemia. During the past year, Jeremy has spent 159 nights in hospital (more than 5 months or over 40% of the year!) and has visited hospital clinic 47 times. This means that he has spent more than half the year at hospital. and 1 bone marrow transplant! On a happier note, he has also had 37 gate passes, and lots of cheerful and caring nurses and doctors! Most importantly, he has had the constant and faithful prayers of so many of you - for which we humbly say "thank you". Thank you, dear Lord, for the special gift of hugs and cuddles from our little man in the mornings! The nurses and doctors were happy to see Jeremy in his school uniform at hospital clinic this morning. Praise God that the doctor was so pleased with Jeremy's progress that he doesn't want to see him again for another month! The next time that he sees Jeremy will be for his 6 month bloods, when they will test his immune function to see whether he is ready to have his childhood immunisations again. They will also run blood tests to see if he still has any of his food allergies (dairy, egg, all nuts and mango) - hopefully he has been cured of these allergies, now that he has a new bone marrow/immune system. The doctor also booked another bone marrow aspirate for Monday 12 April 2010, and we are praying that the results will again be "MRD negative". Alas, Jeremy has gone back to his poor drinking habits at school. Yesterday, he came home with an almost full drink bottle of cordial. This morning he announced that he wanted water instead of cordial, but still brought back most of the water at the end of the day. This means that he has to drink extra after school to make up, resulting in interrupted sleep because he has to go to the toilet once or twice in the middle of the night. Stephanie stayed home from school today because she has a cough and sniffle (but is otherwise happy and active) - we wanted to make sure that she is rested and gets better, so that there is less chance of Jeremy becoming sick. But it is difficult to keep them apart at home, because they want to play with each other so much! Jeremy's hair is soft and slightly wavy, now that it is growing longer. We had jokingly complained to the doctor why it wasn't blonde as well, as the myth is that a person's hair changes colour and texture (from straight to curly, or vice versa) when it grows back after chemo. It could be that his hair will go back to being spikey and straight after his first post-transplant haircut, but at the moment we are just enjoying his new "fluffy baby" hair. 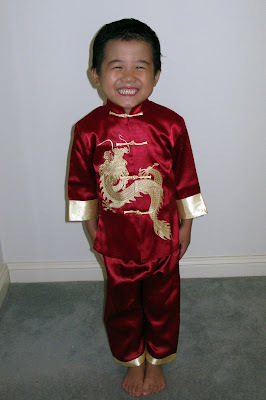 Stephanie and Jeremy looked very smart in their Chinese outfits as they went to church this morning. They both went to Sunday School assembly, but Jeremy couldn't stay in his Sunday School class because some of the other kindy children were a bit sick. After a new year lunch with family, Stephanie and Jeremy were pleased to help TaiTai and others make savoury and sweet jin deui. First they learnt how to knead the dough, then shape the dough into balls, and finally roll the balls (once they had been filled) in sesame seeds ready for deep-frying. Both of them were very keen to be involved in the cooking, and were proud to eat the jin deui once they had been cooked. They also had fun playing with their cousins - this was the first time that Jeremy has played with them since transplant. Today was an enjoyable day spent cleaning up before Chinese New Year tomorrow and relaxing at home together. The cordial seemed to do the trick, as Jeremy came home with an almost empty drink bottle! We will try it again next week, and hopefully he will keep up his drinking. This week, about half of the food that he brings to school is still in his lunch bag at the end of the day. He claims that he is too "full" to eat - but speaking to the other kindy mums, this appears to be common as the kindy kids are too excited and too busy to sit down and eat. It may also be rather hot outside in the playground for him to feel like eating, and at the moment we are not concerned because he is eating OK at breakfast, afternoon tea and dinner. Although the weather is so hot and he is so active, Jeremy is not drinking enough at school. At the end of the day, his drink bottle is still about 90% full of water. We are not sure if this is related to his reluctance to use the school toilets, but tomorrow we will give him cordial instead and see if this fixes his drinking problem! This morning before school, Jeremy felt quite hot - but when we took his temperature, it was 36.7! He was otherwise his usual chatty, bouncy self and had a good full day at school. We are thankful that God has protected him from all the "kiddy germs" at school, and pray that Jeremy will be able to enjoy the rest of this year at kindy without getting sick. Today was Jeremy's first sports day! He had a very active day - he started by running up the hill, then walked BaBa all the way to the station and back to school, played at recess and lunchtime, and participated in sport. He also managed to do lots of "work" in class, and after school he raced back home for an iceblock. It's amazing he can do so much in this hot and humid weather! The doctor rang this morning with good news about Jeremy's bone marrow aspirate last Monday - the results are again "MRD Negative", meaning that there are no detectable leukaemia cells in his bone marrow! We are so thankful to God! Praise God for another day of "firsts"! Sunday School started this morning, and Jeremy was happy to say "goodbye" to us and sit attentively in class. It is his first time attending Sunday School since his transplant, and he had missed many weeks prior to that because he was in hospital. After church, we were thankful that we could go to housegroup again as a family of 4 - another first since transplant! And tonight, Jeremy and Stephanie squealed with excitement when we suggested that they have a bubble bath - this was actually Jeremy's first bubble bath since he had his central line inserted in February last year. Jeremy had another happy day at school. This morning the teachers announced that there would now be 6 kindy classes, instead of 5, as there are so many children in kindy this year. Some children were moved to the additional class, but Jeremy is staying in the same class with the same teacher. This morning at school, Jeremy enjoyed a visit from the fire department before he had to go to hospital clinic for a checkup. Jeremy was pleased that his kindy class was allowed to climb inside the fire engine and touch the fire tools, whereas Stephanie's class could only touch the tools (but she also had a visit from the police department!). Today's checkup was a quick one with not much waiting around. The doctor told us that the initial results of Monday's bone marrow aspirate down the microscope showed healthy bone marrow - the proper MRD results will hopefully be available by next week. Jeremy was keen to go back to school this morning, and pleased with his efforts at the end of the day. After school, the hospital community nurse and the Back on Track representative met with Jeremy's teacher and another kindy teacher to explain Jeremy's medical history and to discuss how best to help him at school this year. Mummy went to the meeting as well, and the main issues were regular handwashing for all the children, having a well-ventilated classroom, notifying us of any cases of chicken pox or measles or flu, and keeping him away from sick children (or rather, sending the sick children home where they should be!). Jeremy's bone marrow aspirate went ahead today around midday, and there were no problems or complications. We should know the MRD results in a week or so. The doctor also said that his central line site and his femoral line site are healing nicely.